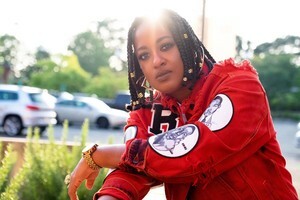 Marlanna Evans was born in 1983 but most properly introduced to the world as Rapsody in 2011 (when mixtape For Everything attracted icon Kendrick Lamar for a feature). It was then that her destiny as a vital, poignant voice at music’s forefront was guaranteed — even before the release of her debut album The Idea of Beautiful in 2012. That album was the sound of a preternaturally wise young artist claiming her throne. Though not egocentric, her combination of cheeky wordplay and stone-faced directness showed a confidence that announced her fixture as the next important voice of a generation. No wonder it included (and later earned her) collaborators like Ab-Soul, Anderson .Paak, Black Thought, Busta Rhymes, Chance the Rapper, Jay Electronica, and J. Cole — essentially the who’s who of both modern and golden-era rap history.